Last edited by boglehat on Thu Nov 29, 2018 1:23 pm, edited 3 times in total. My first thought is that the article is paywalled. Last edited by boglehat on Thu Nov 29, 2018 1:23 pm, edited 1 time in total. I have been suggesting active/passive portfolios for those worried that markets might become inefficient if indexing gets too popular. Maybe 20% active and 80% passive, using lower cost active funds like what Vanguard offers. It might be that indexers might have to make a contribution to keep the markets efficient. My take on this is that any "problems" with indexing are a long ways off. Hedge Funds, the long only factor funds, and the long/short factor funds will keep things pretty efficient. The exact regulation/law escapes me (I believe it's from the post-great depression time period, but am not certain), but aren't there limits on the % of ownership in the stock market by a single entity (eg. Vanguard, Fidelity)? 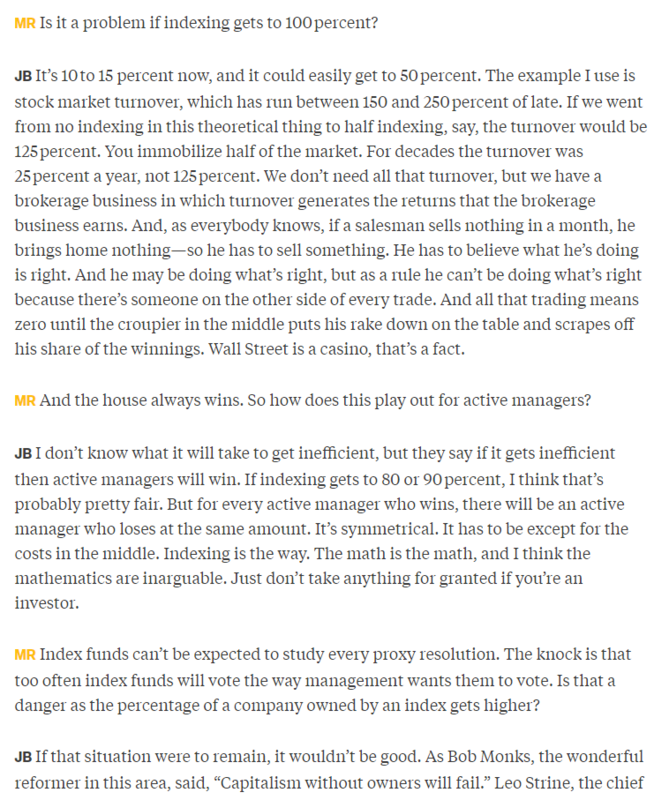 Also, doesn't greater index fund ownership to the levels Bogle worries about in this article create more opportunities for active investors? If index fund ownership of the market continues to increase, won't the balance eventually tip so far that active funds likely end up with greater returns than their indexed counterparts, swinging the divide back towards more neutral ground? I would start to worry when we hit 70-75% in index funds. This is not really about maintaining market efficiency. It's about who owns the companies. If the same 100-1000-10 000 employees at Vanguard and Blackrock's corporate governance teams get to decide what Vanguard and Blackrock does with their ownership of 60-70% of the US stock market in 10-15 years, that's no different than pretty much every public company in the US being majority state owned (aka communism). It's pretty ironic that Bogleheads dismiss this as a nothingburger, even when John Bogle himself is concerned about. Well, I am old fashioned enough that I still own individual stocks. It seems now that I am way behind the times. If Bogle is right, maybe I am way ahead of my time. What is old is new again. I think the problem of three providers owning 60%-70% of the US Stock Market is a long ways off. After all, there are more mutual funds out there than investable stocks. Something like 10,000 vs. 3,500. Not only that, you have the factor portfolios that have grown in popularity. Not worried yet, but something to keep an eye on. • Timely and full public disclosure by index funds of their voting policies and public documentation of each engagement with corporate managers. This would take today’s transparent and constructive governance practices several steps further. • Require index funds to retain an independent supervisory board with full responsibility for all decisions regarding corporate governance. The problem with this idea is that it is not clear how such a board could add to the present scrutiny of the fund’s independent directors. • Enact federal legislation making it clear that directors of index funds and other large money managers have a fiduciary duty to vote solely in the interest of the funds’ shareholders. While I believe that such a fiduciary duty is implicit today, making it explicit, with appropriate penalties for violations, would be a constructive step. Mr. Bogle is founder of The Vanguard Group and creator of the first index mutual fund. This article is adapted from his new book, “Stay the Course: The Story of Vanguard and the Index Revolution,” to be published by Wiley on Dec. 6. Index funds provide incredible value for investors, and they will continue to in the future. At such time as their ownership share becomes "uncomfortable", I expect that there will be some updates in corporate governance. The three items above seem reasonable; I'm sure there are others as well. Not to be a stickler, but copy-and-pasting the entire article without permission likely constitutes copyright infringement. So let's be draconian and say the one fund company owns all equities, hence the complete total stock market. Almost sounds like public went private. Until they want to go public again and sell to the "outside". Calling such ownership levels state owned and communism seems like a mighty long leap for me. It would neither be state owned, state controlled or communism. Well except for the fact that the mutual fund companies don't own anything, the individual investors in their funds do. I have a question... why can't the voting rights be transferred directly to the individuals? Perhaps a board could provide a recommendation, but provide an online portal where Vanguard index fund owners can go in and utilize their votes. The article needs to be excerpted rather than quoted in its entirety. From a data standpoint, this is technically achievable. Perhaps the big index fund managers could poll fund owners on key issues for board meetings. This could potentially prevent them from mandating their own personal preferences on the corporations. Not sure what I, as an individual index fund investor, am supposed to think or do about it. It seems to me like a "cross that bridge when we come to it." Apart from being poised to protest to my government representatives if someone gets some kind of bright idea like "let's make indexing less attractive by taxing it" or "let's require that all index funds be bought only through advisors." I certainly am not going to buy actively managed funds out of some sense of social obligation! The Center for Retirement Research has recently written a series of briefs on medicare and social security. These are markedly more germane to my finances than some theory on the future of index funds will ever be. When you read noise, you get noise. Garbage in, garbage out. Can help but ask, what will happen when Asian e.g. Chinese equivalents to Vanguard et al. starts buying US companies through index investing? In the long run they will dwarf the West. The resulting democracy would definitely shake things up. CxO's depend on the majority of votes coming from a a few buddies to be able to extract their extreme compensations. If the average Vanguard member were more represented in corporate governance things would be quite different I think. Not sure what I, as an individual index fund investor, am supposed to think or do about it. What I did was read BlackRock, StateStreet and Vanguard's proxy voting policies. From reading these, along with some recent quotations from folks at each company, I decided to buy VIOO rather than IJR or SLY despite IJR having the lowest expense ratio of the three. Open a private browser and Google the title of the article “Bogle Sounds a Warning on Index Funds” click on link and enjoy. It isn't working for me. I don't know why not. WSJ is pretty serious about its paywall, though. Yup, seems that the WSJ has upgraded their paywall, which comes as no surprise. If the market became inefficient enough that mispricings were common and persistent, I don’t think investing in individual stocks will be a reasonable defense against the risks. You will be up against the giant squids of the investment world and they will have better data and know-how to judge fair prices. Last edited by Northern Flicker on Thu Nov 29, 2018 10:11 pm, edited 2 times in total. Why is Bogle writing such speculative and fear-mongering articles? Is he bored these days? I don't think this is speculative, nor fear-mongering. It has already played out with Ruger, which the three major index firms collectively own 35% of, this year - obviously we all might agree or disagree with the actual proposals voted on at that shareholder meeting for reasons beyond the scope of this board (and wisely banned from discussion thereon), but it happened. Additionally, BlackRock has been applying quasi-ESG rules to proxy votes with the shares from non-ESG funds for years. Where I disagree with Bogle is his suggestion that codifying fiduciary rules could solve the problem. I bet you could create a specious argument plausible enough to pass legal scrutiny for practically any hobby-horse policy to be in the shareholder's best long-term interest. Heck, the person controlling the votes might even believe the argument themselves! My other area of disagreement is with the unstated assumption that this situation is unique to firms providing index funds/index ETFs. They will own all the votes for the various proposals that companies must submit to them. Unless the one fund company would just provide them the proxy card, that would get really interesting. Also not sure how price discovery would occur - except via company buybacks at that point. Why, exactly, has he changed his tune in less than 2 years? I'm dying to hear everyone's thoughts. The story is behind a paywall... so most people won't be able to read it. On Reddit someone posted a link with the article from outline.com. I don't know if there are any forum rules that I would be breaking by linking to it seeing how it gets around the paywall. If there is no rule against it, I'll happily link to it. Some markets function with only a handful of active participants. I'm not worrying unless you can show me the number of participants that are required to permit a functioning stock market and you can demonstrate that the current market is shy of that number. We will just never get to that point. Even if we did, the results would not be catastrophic, but self-correcting. When markets become exploitable, index gains and active gains will simply converge. You can't get to the point of catastrophe because participants will step in and exploit any inefficiency that might be created by indexing. So there's no problem. But it makes for good headlines. I think Vanguard should allow their shareholders to vote on issues just as if they owned stocks. For example, if you own the Vangurd S&P 500 Fund, you have fractional ownership of those 500 companies. You own shares of those companies. You should be able to vote with your fraction of your shares just like you would if you owned the stock directly. Not allowing that is a pity. Currently it’s my understanding that Vanguard adopts a neutral stance and does nothing to represent shareholder interests. Try with Chrome if you are a Mac user, I forgot about that part. I merged GoPackGo's thread into the on-going discussion. I also removed a post which linked to a website that reproduced the article in its entirety. This is a violation of the WSJ Subscriber Agreement. This will work except in Florida, where they will somehow screw it up. The WSJ paywall has gotten pretty good. Now days there are several types of paywall. Cookie based paywalls often allow you to read a limited number of articles in a given time period. They track your usage based on cookies that are saved to your device in the browsers cache of cookies. Many of them can be bypassed by either deleting your cookies or using a private browser such at Google Chrome incognito mode or Internet Explorer in-private browsing. These browsers use a separate cookie cache that is either not kept or deleted when you close the session. Other website use a scripting based pay wall. They will have the entire content of the article on the page but then use a scripting language such as Java to cover the majority of the article. In those cases you can usually either use a browser with an add-in to such as Firefox with the NoScript add-in to disable the scripting and allow you to view the article. As an alternative you can also use your current browser and choose the view the web page source code and the article content is usually available in plain test for you to read all be it without the nice formatting and images. Others can be bypassed by using an archive such as archive.is or using a Google cached page. Did anyone notice that the photo was taken at the 2018 Bogleheads Conference? Check the credits. Merry Xmas big banks, Edward Jones, and the like. Last edited by TheHouse7 on Thu Nov 29, 2018 11:06 pm, edited 1 time in total. Interesting bit of info. Thanks.